A fantastic gift for any new mom and her little baby boy! 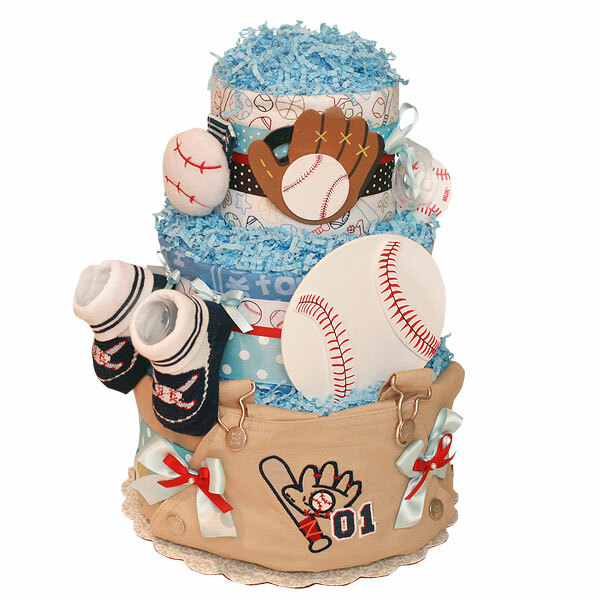 Beautiful handmade three tiers Baseball Diaper Cake is ideal for a Sport themed baby shower! It can be used as a shower centerpiece or just to give as a gift. This is a great sampler diaper cake with different brands of diapers for the new mom to try. This cake is created with total 45-50 diapers. Includes Huggies Snug&Dry diapers size 1 (7-14 lbs. ), Huggies Little Snugglers diapers size 1 (7-14 lbs. ), Huggies Pure&Natural diapers size 2 (12-18 lbs. ), Pampers Baby Dry diapers size 2 (12-18 lbs. ); three flannel receiving blankets 100% cotton with sport theme; one NUK pacifier; one JOHNSON'S Baby Shampoo (This mild, tearless formula baby shampoo is as gentle to the eyes as pure water) 1.5 fl oz; one JOHNSON'S Baby Powder Pure Cornstarch with Aloe Vera & Vitamin E (Gently absorbs excess wetness to keep skin dry and soft) 1 1/2 oz; one JOHNSON'S Baby Lotion (With that unmistakable baby fresh scent) 1 fl oz; one pair of baby socks; one baseball wrist rattle; baseball overalls; wooden embellishments with baseball theme. The diapers are held together by ribbons no glue on diapers. Decorated with pins, ribbons, bows and crinkle paper. This cake sits on a 10" corrugated cake board and 14" high. Comes wrapped in cellophane with coordinating ribbons and bows. All our diaper cakes made of highest quality ingredients with greatest care and love. Everything included is ready to use and easy to disassemble.